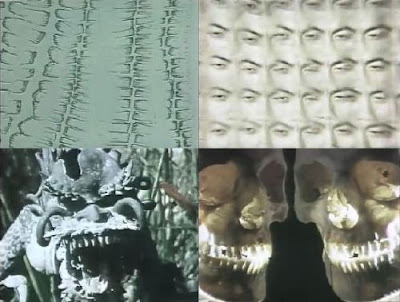 Images du monde visionnaire, an educational film by Henri Michaux and Eric Duvivier which was "produced in 1963 by the film department of Swiss pharmaceutical company Sandoz (best known for synthesizing LSD in 1938) in order to demonstrate the hallucinogenic effects of mescaline and hashish." Ths is a find. One image looks like a severed head riding a magic carpet...or is it riding a dollar bill?